Emner: Sikker Internetbetaling, Forside, Fly Og Hotel I Barcelona, Fly Til Barcelona, og Hotel I Barcelona. 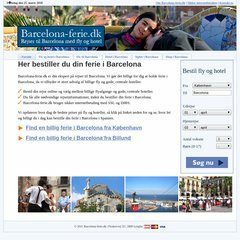 Lignende websites er barcelona-airport.com, barcelona-bus-turistic.com, barcelona-card.com, barcelona-ferie.dk. Den er hosted af Surftown A S Copenhagen, ved brug af Apache webserver. Den har 3 DNS records, ns2.surf-town.net, ns1.surf-town.net, og ns3.surf-town.net. Dens IP-nummer er 212.97.132.202. PING www. (212.97.132.202) 56(84) bytes of data.